Attorney General Jeff Sessions on Thursday offered a full-throated defense of the Trump administration's policy of separating children from their parents at the border, saying that having kids does not give migrants immunity from prosecution — and found justification for his policies in the Bible. Sessions — who last month announced a "zero tolerance policy" to criminally prosecute people crossing the border illegally — made his latest remarks in a speech to law enforcement officers in Fort Wayne, Indiana, telling the group that the migrant families were to blame for their own break-ups and that his department's separation of families was not "unusual or unjustified." "If you cross the Southwest border unlawfully, then the Department of Homeland Security will arrest you and the Department of Justice will prosecute you. That is what the law calls for — and that is what we are going to do," Sessions said. "Having children does not give you immunity from arrest and prosecution." "However, we are not sending children to jail with their parents,” he said, adding that the policy "can result in short-term separation." "Noncitizens who cross our borders unlawfully, between our ports of entry, with children are not an exception," the attorney general said. "They are the ones who broke the law, they are the ones who endangered their own children on their trek. The United States, on the other hand, goes to extraordinary lengths to protect them while the parents go through a short detention period." Current law does not prohibit separating children from their parents. In addition, several evangelical groups sent a letter to the White House this month, asking Trump to protect families at the border that were fleeing violence. Sen. James Lankford, R-Okla., a evangelical pastor and Christian camp director, tweeted Thursday morning that he was personally asking the White House "to keep families together as much as we can." In his remarks, Sessions hit back at the "concerns raised by our church friends about separating families," calling the criticism "not fair or logical" and quoting Scripture in his defense of the administration's tough policies. "Persons who violate the law of our nation are subject to prosecution ... 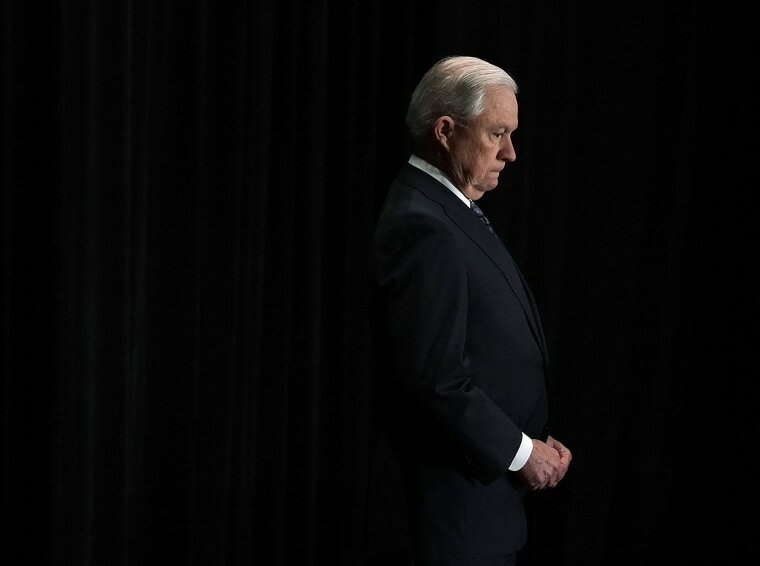 I would cite you to the Apostle Paul and his clear and wise command in Romans 13 to obey the laws of the government because God has ordained the government for his purposes," Sessions said. "Orderly and lawful processes are good in themselves ... and protect the weak and it protects the lawful." He called on religious leaders to "speak up strongly to urge anyone who would come here to apply lawfully, to wait their turn and not violate the law." Later Thursday, White House Press Secretary Sarah Sanders doubled down on Sessions' comments, saying it is "very biblical to enforce the law." "That is actually repeated a number of times throughout the Bible," she said, responding to a question about Sessions' comments about Scripture's supporting the administration's policies. Many of the children separated from their parents have ended up in enormous facilities that more closely resemble prisons, where they spend 22 hours per day during the week locked inside overcrowded buildings. Sessions, however, said the U.S. government facilities, which are run by the Department of Health and Human Services, "care for the children in a good and decent and proper way" and blamed the parents of the children for subjecting them to "such a treacherous journey." "It's not as if we just want to see if we can be mean to children," Sessions added. The attorney general also defended his ruling this week that fear of domestic abuse or gang violence is not an acceptable basis for granting asylum. He claimed that he had not made new law and that he had "simply restated and implemented what Congress has passed: Asylum is generally not for those who have suffered a private act of violence." "I am not going to apologize for carrying out our laws," he added.